A fantastic large, open plan Shoreditch office space has become available at Bentima House, 168-172 Old Street, a large landmark office building in Shoreditch with an impressive black facade. A large leased office space is available to rent. 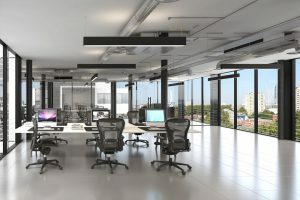 This Shoreditch office space measures 5,000 sq ft, and can accommodate 85-90 workstations. The office is L shaped, has an open plan layout and a high quality interior. Within the private office there is a kitchen area, WC and shower facilities and space to accommodate meeting rooms, or an additional breakout area. Other facilities provided at Bentima House include: air conditioning and heating, bicycle storage, CCTV monitoring and high speed internet. The building also offers 24/7 access and other services such as cleaning and rubbish collection are also provided. After San Francisco and New York, the area around the Old Street roundabout is home to the third highest number of startups in the world. Many of these small upcoming businesses are focused on the tech industry, earning the area the name “tech city”. There are also plenty of businesses working in fashion, media and the creative arts. Shoreditch is definitely the coolest area of London. So there are plenty of places to go out. Nearby cafes include The Shoreditch Grind, Black Opium (a specialist coffee house, which also serves cocktails in the evening), and Attendant on Great Eastern Street. If you have a team that likes to work hard and play hard then you’re also spoiled for choice in terms of nightlife. Some of London’s trendiest night spots like The Nightjar, The Hoxton Pony and The Blues Kitchen are also within easy reach. Bentima House is just three minute’s walking distance from Old Street Station, giving you access to the Northern line and mainline trains into Hertfordshire. Shoreditch High Street Overground Station and Liverpool Street Station are also nearby. If you’re interested in renting a large office space at Bentima House, or a similar commercial property in Shoreditch, get in touch with us today to arrange a viewing. We receive new properties available in Shoreditch every day, so we’ll be able to match you with a premises that’s suitable for your business. Contact Maya, our property expert to book your viewing or to find out more information. This entry was posted in Large Office Space, Old Street Office Space, Shoreditch, Shoreditch Offices to Rent, Silicon Roundabout, Tech City by Maya. Bookmark the permalink.